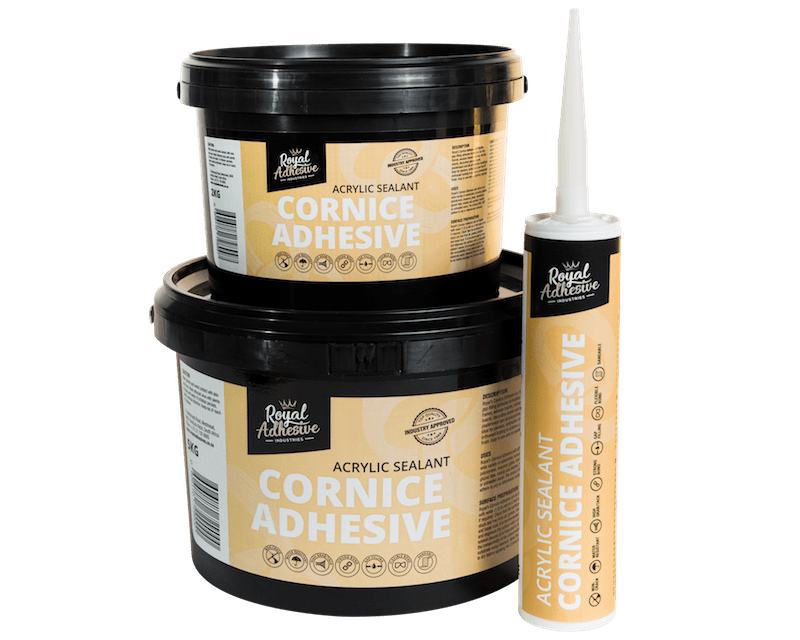 Royal Cornice Adhesive is a flexible, gap-filling acrylic sealant formulated for door frames, window frames, ceilings, skirting boards, decorative plaster pieces, plasterboard, and all polystyrene mouldings. This product is ideal for painters, contractors, and the DIY enthusiast looking to achieve a professional finish. It is easy to use, and no sanding is required. This product WILL NOT adhere to oily or bituminous surfaces. Apply the Cornice Adhesive to the moulding using a wide putty knife or suitable tool along the full contact surface. Carefully position the new adhesive moulding against the prepared surface. Apply a steady, gentle pressure allowing the excess Cornice Adhesive to squeeze out. Wipe off the excess material with a damp cloth and allow to set for final curing. Wash tools and hands with regular soap and water to clean. The actual drying times depend on humidity, temperature, and film thickness. One 280 ml cartridge of Cornice Adhesive should do 6.5 linear meters of cornicing. If required, Royal Cornice Adhesive can be diluted with water at a ratio of 1:2 to use as a first coat primer. Check that the surfaces to be stuck are free from oil, grease, moisture, and loose dust. Cleaning and degreasing the surface with a compatible solvent cleaner is recommended (first, test the compatibility of the solvent and the substrate you are cleaning). Allow the surface to dry before applying the Cornice Adhesive.